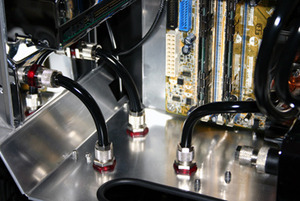 There are few things in the enthusiast computing world that are as misunderstood and feared as water cooling. When done right, it can be a beautiful addition to a case while keeping temperatures down and noise low. When done poorly, it can be a tangled mess of dangerous tubing that cools worse than air, but can fry your new £350 graphics card in a moment. It's the fear of that latter scenario which has left many of us on our safe, air-cooled ground. After all, investing in water cooling is not cheap to begin with, and when added to the risks, it almost seems like a no-brainer to go buy the latest block of Zalman copper and call it a day. Some people wouldn't even know where to begin when setting up a system. Yeah, there are basic parts, but which ones? Is it best to stick with a brand name? Is there a certain size to buy? And how can the system stay safe if there's a leak? It's those of you who are shrugging at some (or all) of these questions that this article is geared towards. For those of you who are saying "Been there, done that," fear not - this is only the start of what is a new direction in bit-tech's modding content. We've been ignoring water for way too long, and now it's time to get our feet wet. The first question you have to ask yourself is, "If water poses so many risks, why use it?" A look around our forums will illustrate lots of people using it, but for most it just keeps temps a few degrees below what air cooling would. True, you could use a TEC (Peltier) cooler in addition to water, but that's a bit...well, extreme for most. So since it doesn't turn your PC into an ice chest, why use it? Water "moves" more heat - Though temps aren't going to ever get lower than the ambient air, (the same limit as air cooling) water can absorb way more heat per second and carry it away from your chips. This means that even if you wouldn't get much benefit at stock speeds, higher temps from increased voltages and clock speeds (as well as numerous cores) well above spec can be dissipated quicker. Water can change your space requirements - If you've not got a lot of space for a huge CPU cooler, but want something quiet, water is the perfect answer. Tubing can be cut to any reasonable length, so you can route the cooling anywhere and lower the profile without sacrificing a bit of performance. Water is quieter - Because water moves more heat than air in the same amount of time, it's possible to cool way more with less noise. Whereas air cooling the latest GPUs requires potentially noisy dual-slot coolers, water cooling can free up space while taking the noise away completely. A slow-spinning 120mm fan on a copper radiator will do a better job, while freeing up trapped PCI or PCIe 1x slots. Water looks better - Let's be honest - that copper flower may be alright, but nothing looks quite as slick as an acrylic-topped block with a small LED buried in it. And properly done tubing can be anywhere from nearly organic looking to a steam-punk dream. These ideas may not be compelling enough to draw you to the wet side...but let's be honest, what kind of geek would you be if they didn't?! Looks better, cools more, and does it all quietly - that's pretty much the holy grail of what we want from a cooling system. Of course, we have to keep in mind some simple ground rule expectations, first. Water cooling is a lot like all things in life - garbage in, garbage out. You get what you pay for. Caveat Emptor. Et cetera, et cetera - insert whatever cliche saying that you please. As such, you need to make sure you know what you're getting into. First and foremost, good water cooling is not cheap. It's best to start off with one simple loop - but even then, you are looking at a quick £100-150 (roughly $125-175 USD) between all of the parts. When compared to a £30-40 air cooler, that's a very sizeable investment. So if you're looking for a cheap route, be warned - the place where companies skimp end up being on seals and fittings and all the little "extras" that keep your computer, well, dry - which it really needs to be! Second, you can't expect to ever run below the ambient temperature of the room. At the end of the day, water is still forced-air cooling - it's just that the location has changed, and so has how much it can cool. The laws of thermodynamics prevent you from ever getting cooler than the coldest point of contact - and since that is ambient air, you cannot go lower than that. If I had a penny for every time the question has popped up in the forums as to why someone's temps can't get back down into the 20s on a 30+ degree week...well, I'd be rich. Finally, you cannot get better than average air-cooling temps out of any current pre-built kit. They exist for a reason, and there are some times when they are the most convenient solution to cool a mid-range system (like a home theatre PC) inaudibly. However, kits are designed to be generally useful to a wide audience - not honed in on your 8800 GTX and quad-core processor.